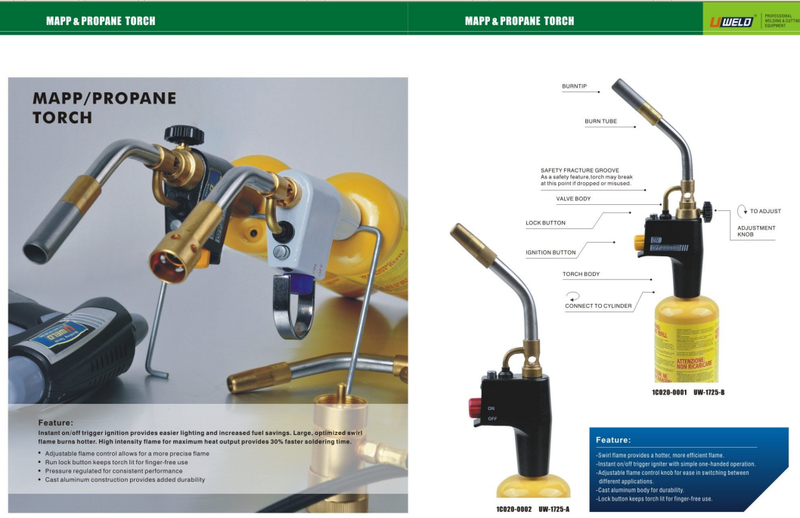 Product categories of MAPP Torch, we are specialized manufacturers from China, MAPP Torch, MAPP Gas Torch suppliers/factory, wholesale high-quality products of Plumbers Gas Torch R & D and manufacturing, we have the perfect after-sales service and technical support. Look forward to your cooperation! MAPP Torch is characterized by instant on/off trigger ignition provides easier lighting and increased fuel savings. The propane blow torch is with large, optimized swirl flame burns hotter. High intensity flame for maximum heat output provides 30% faster soldering time. Plumbers Gas Torch can be divided into torch with or without self ignition. 4. Cast aluminum construction provides added durability.